Creative Assembly has released the next in a series of videos introducing the units of Total War: Warhammer. Previously, we were shown the horse-eagles. Today, it's the turn of the small guys with the big hammers—or Dwarfs. 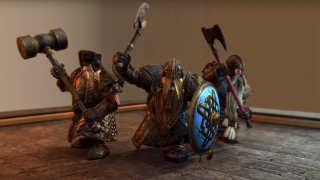 "In this ‘Introducing’ video, the Dwarfen units revealed are Longbeards, Ironbreakers and Hammerers. Dwarfs are expert craftsmen, most working in ancient forges and workshops where centuries, if not millennia, of hereditary knowledge are smithed into weapons and armour whose quality cannot be replicated anywhere else in the world. Dwarfs are expected to maintain their own arms and armour, and once they don their heavy Dwarf mail, they are an impressive sight to behold." This only a tiny (pun intended) taste of what CA are doing with Total War: Warhammer. For more, check out the recent Battle of Black Fire Pass demonstration, or read the lead writer explain how the game is more Total War than Warhammer.